Working with the technology company Westcotec, the Joint Operations Unit is using a piece of technology, previously trialed by Norfolk County Council, which can detect when people in a car are using their phones without using a hands free device. The system identifies what type of signal is being transmitted by the handset and whether it is being used via the vehicle’s Bluetooth system. When the relevant signal is detected – indicating that a mobile phone is being used within the vehicle – the road sign is activated as the vehicle passes, giving a flashing visual message. However, the technology cannot distinguish if it is a passenger or the driver who is using a phone and so the sign is activated regardless of who is using the mobile. As a result, the force says the technology will not be used as an ‘enforcement tool’, but to educate motorists and identify offending hotspots. These are the first commercial installations of Westcotec’s mobile phone detector signs which are activated by sensors that pick up 3G or 4G signals. Funded by Highways England, the signs will be used in locations across the north and south regions of the Thames Valley and Hampshire police force areas. PC Liz Johnson, a road safety officer for Thames Valley and Hampshire’s Joint Operations Roads Policing Unit, said: “Research shows us that you are four times more likely to crash if you are using a mobile phone whilst driving (and) reaction times are around 50% slower than a driver not using a mobile phone. Chris Spinks, managing director of Westcotec, stresses that the signs have been designed not as an enforcement tool, but as a warning to drivers who may think the chances of being detected are extremely low. 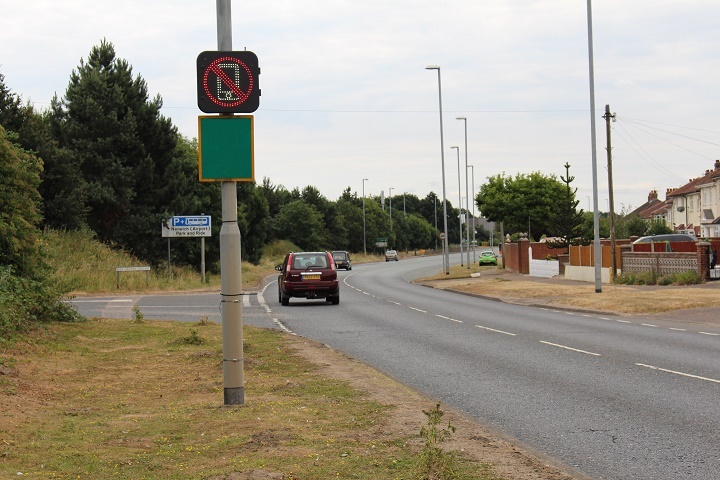 Chris Spinks said: “A long-term trial of one of these signs in Norfolk last year brought excellent feedback from police and road safety professionals. Their vote of confidence has now been followed by our first commercial supply contract. “The signs are battery powered, and therefore easy to move from one site to another. No footage is recorded and no prosecutions will result from activations of these signs. 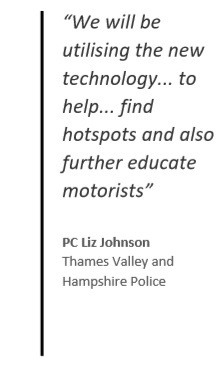 “They are to be sited at mobile phone ‘hotspots’ across Thames Valley and Hampshire, with the aim of reminding and educating drivers. The technology will become operational on Monday (15 April) to coincide with the launch of a week-long enforcement campaign taking place across the country. The week-long campaign is being coordinated by the National Police Chiefs’ Council – with a warning that one moment of distraction can lead to ‘devastating consequences’. What will happen when pedestrians walk by without hands free via Blue Tooth, or a 52 seater coach passes by with everyone on their mobile phone. Or when vehicles pass by in the other direction. If drivers see a sign telling them they are on their mobile phone when they are not then the message will be generally ignored by most. With some 30% on drivers admitting they use mobile while driving, this is not likely to be one off use but regular use every day. And 30+ million drivers it amounts to 10’s of billions of illegal use of mobile phones when driving. How do they intend to identify hotspots with such illegal use of mobile phones. The country will be covered with such flashing warning signs.